Beautifully maintained home with updates throughout. 4 BR/3.5 BA pool home with a split-bedroom floor plan, expansive pool deck, and proximity to the Countryside C. C. The moment you walk through the stylish front door with its leaded glass and sidelights you will notice the pride of ownership. The open concept kitchen includes granite countertops, SS appliances, breakfast bar, pantry, and new dishwasher and refrigerator. The kitchen overlooks the family room which features a beautiful stone fireplace. The wall of glass sliders disappears into pocket doors opening the family room to the large covered lanai and expansive screened-in pool area. This feature, along with the heated pool, spa, and 1900 sq. ft. of pool deck make for easy entertaining. The master bedroom w/âhis & herâ closets and walk-in master bathroom has French doors out to the pool area. The walk-in master bathroom is impressive w/travertine and granite throughout, dual sinks, champagne jetted tub and separate shower boasting a rain shower head. The âJack & Jillâ bathroom that joins the 2nd & 3rd bedrooms also enjoys a jetted tub. With over 1/4 acre, this home has add'l yard space outside the vinyl fenced-in yard. 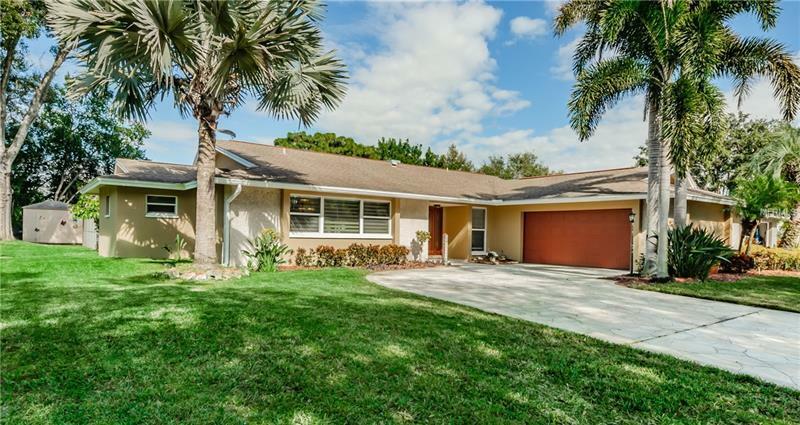 Add'l updates and conveniences: outside pool bath, pool storage room tropical printed patio screens, motorized drapery, new variable pool pump & filter, updated windows, newer flat roof, newer exterior paint. No HOA and non-flood zone. Located near Countryside Country Club, shopping, restaurants, and top-rated beaches. A must see!